Laugh - Cry - Think! : What’s so amazing about saying grace? What’s so amazing about saying grace? Recently, The Edge came across an untranslated Dead Sea serviette that presents 10 instructions God gave Moses about grace. This helps explain some of the idiosyncrasies with this tradition that’s taught to us from Christian childhood. Below is the best English translation we could decipher. For all food or nutritionally beneficial beverages that require more than four mouthfuls or more than 12 minutes to consume, grace is required. Saying grace before a meal will add to the nutritional value and filling capacity of a meal (and if the grace rhymes the taste of a meal will also improve). Grace may be said up to 12 seconds into a meal, though all chewing must cease during the grace or it will be declared null and void. Blessing the hands that have prepared the food ensures that the cook’s hands were washed before preparing the meal—even if they weren’t. 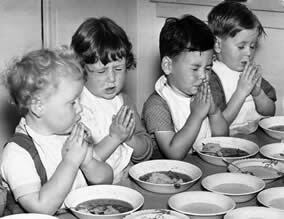 There is a time limit of seven minutes between saying grace and starting to eat the meal before the grace expires and needs reinstating. A grace is valid for all food consumption and only ceases its functions when 77 minutes pass between any two mouthfuls. Singing or holding hands during grace will scare away all germs that may be present in the meal. One person may pronounce a grace for an entire group but a SYO order (Say Your Own) must be openly declared if this isn’t going to happen. Calling out “Grace!” has no affect on the meal but will bring laughter, groans and confused looks from different people in the vicinity. Food poisoning may result if the above guidelines are ignored 70 x 7 times. Enjoy your meal. Did you know? Not closing eyes during grace cancels all positive affects grace would otherwise have. The angels can’t secretly “do their stuff ” to your food if your eyes are open! Scott the Mood for Cooking!